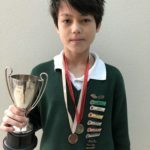 Hiromu Crosado wins awards for his piano playing at the Christchurch Competitions Society Inc in July. Congratulations to Hiromu Crosado who won awards at the Christchurch Competitions Society Inc FESTIVAL OF THE ARTS in the Instrumental Section in July.and under 15 years. New Zealand Composer – Piano Solo – 1st place in the 12 and under 15 years. Piano Solo – Own selection – 3rd place in the 12 and under 14 years. Well done Hiromu. We were treated to performances of these pieces at the UC lunchtime concert last week.